Teams are still working full-force on the National Mall for the Solar Decathlon, an international design competition sponsored by the U.S. Department of Energy. Twenty teams selected from top colleges and universities across the world have designed and are building and livable energy-efficient solar-powered homes on the National Mall. In a series of ten contests, each team will be judged based on aesthetics and performance. As we face environmental challenges throughout the world, the Solar Decathlon will promote renewable energy, energy-efficiency, and efficient design. Walking around yesterday, well into the evening, you could see that the teams were still working hard. Some teams seemed to be ahead of others. If you’re a fan of modern architecture, you’ll love what you see. Some of the homes use solar panels as the exterior wall siding. There are lush gardens (VT’s home has a pond). Compared to your average American home, these are small, yes, but most are the size of a moderately sized apartment. Aesthetics aside, these homes will produce equal or more energy from renewable sources than is consumed by its lighting, appliances and more. The lessons learned here go a long way in solving the challenges of climate change. 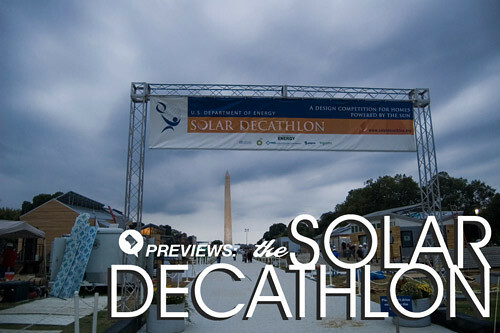 The public opening of the Solar Decathlon will debut this Friday, October 9th. Public tours and free consumer workshops instructed by industry professionals will also begin on opening day and close on October 14th. The opening ceremony will take place on Thursday, October 8th at 1 PM. Goals: “To educate the student participants—the “Decathletes”—about the benefits of energy efficiency, renewable energy and green building technologies. As the next generation of engineers, builders, and communicators, the Decathletes will be able to use this knowledge in their studies and their future careers. For live updates from the field (including photos and video) follow Solar Decathlon on twitter. More photos are posted on ReadysetDC. America govNational MallSolar DecathlonUS Department of Energy.